It’s time to catch it, trick it, kick it and go active now in your school! Cartoon Network presents children with a non-stop fun experience with their latest School Contact Program called Go Active Move It Movement, placing the fun and action element on center stage. The Go Active Move It Movement involves an action-packed day in schools loaded with games, contest, prizes and more! Over 5 lakh students from 550 schools across 10 cities in India are touted to participate in this toony action activity with power-plays and off-the chart fun. The Go Active Move It Movement focuses on activities revolving around developing physical skills, teamwork, building stamina and strength in true Cartoon Network style. In Delhi, Cartoon Network will cover approximately 100 schools and engage over one lakh students between July to October 2013. To add to the excitement, Ben 10 made a surprise visit at Air Force Bal Bharati School, in Lodi Road today and entertained kids with a special performance. 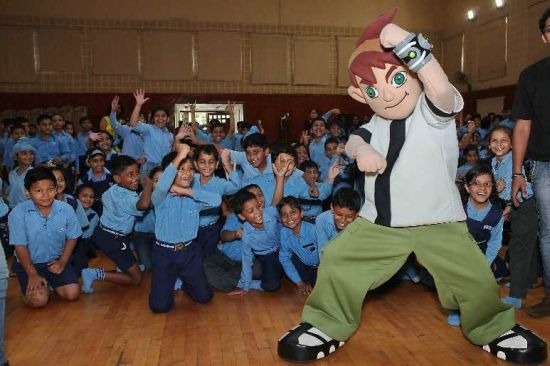 Children were thrilled to see their favourite super hero and were eager to Go Active with Ben 10! Cartoon Network’s Go Active Move It Movement will be conducted across Mumbai, Delhi, Bengaluru, Hyderabad, Ahmedabad, Lucknow, Kanpur, Ludhiana, Coimbatore and Amritsar from July to October 2013.